Here’s the latest edition of Swag Watch, the second one thus far! Last week I spied a very good deal on Amazon, an EarthBound cart was selling for $60. I posted about it on Twitter and almost immediately someone snatched it up. EB carts go for usually $20 more than that, so whoever got that, way to go! 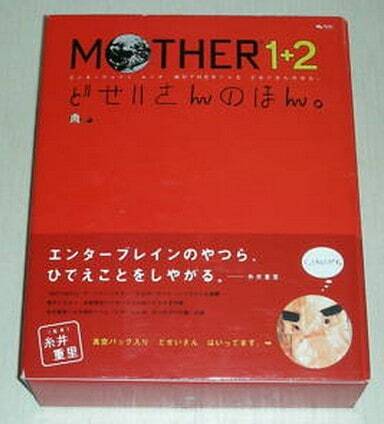 There’s also a Mr. Saturn MOTHER 1+2 Art Book on eBay right now. These are pretty high on the collectibility scale, even more so if the Mr. Saturn plush that comes with it is intact – which is the case with this one. These are always pricey, but if you can afford it, I recommend it. 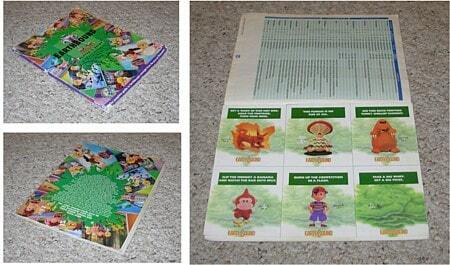 Next, there’s an EarthBound Player’s Guide for sale that’s cheaper than average, looks to be in decent condition, and has the scratch-n-sniff cards too. On Yahoo! 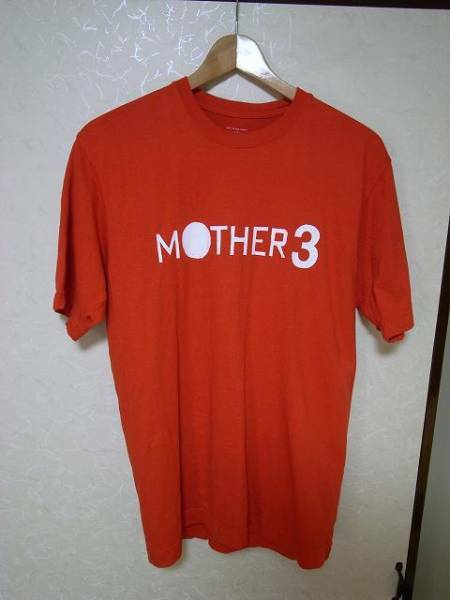 Auctions Japan there’s an official MOTHER 3 T-shirt. These are incredibly hard to come by nowadays and unlike most MOTHER series shirt, these ones were designed and sold by Itoi’s company directly. Lastly, remember this fan-made poster? Well, it’s finally up for sale, so if you’re interested, check it out here! That’s all for this time, if you notice anything cool on eBay, YAJ, or anywhere else, just let me know. It may take a while, but I’ll probably eventually post about it in one of these Swag Watches. hey whats going on with the GBA EB translation? still chipping away at it? 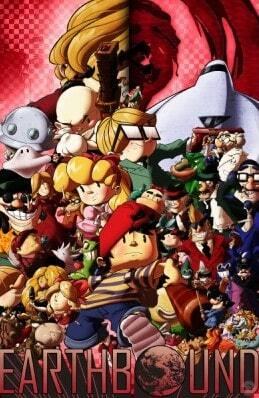 No one’s working on the Mother 2 part. I was working on the M1 part but it’s been on hold for a good while now due to lack of spare time. Ahh, I’m not sure what, but my goal right now is to get some form of Mother merchandise in my life. Everything up there I would kill to have, but I suppose it’s not worth it since opposed to me some fans would probably start a holocaust for them, pun intended. I can get a Super Nintendo real cheap at a local flea market, so unless I see one there I guess I’ll just end up getting an actual cartridge or maybe a plush when one’s affordable since they’re all within my limits at the moment. Besides, I just got a MOTHER 2 cart. Is that valuable? Mother 2 carts are nowhere near as valuable as EarthBound carts are. Still a nice addition to your collection, though. The last time this happened, they went out of stock quickly as soon as it was posted about here, so get ’em fast if they are indeed in stock. What I’ve learned about the KOG site is that their stock is displayed in realtime or so to speak. When someone adds a shirt to their cart, it subtracts it from the current stock until they remove it or their cookie expires. Equivalent to a real store where picking an item off the rack makes it inaccessible to anyone else until you put it back. As far as those KOG shirts go…I really regret missing the opportunity to get a smash shirt. Agggggh oh well lessons learned. Damn!!! 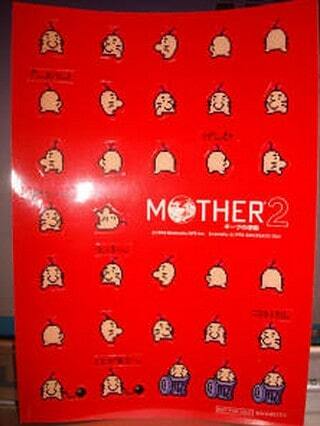 Well… What about a Mother 3 or Mother 1+2 cart. I own both of them. How about that?? Yikes. I think I got my sealed M1+2 Artbook for no more than $200. And I don’t know if I own that red Ultimate Chimera shirt or not. LOL If not, I need to get it. I attempted to buy the poster the other night when I was drunk. It seems to be denied because of copyright infringement though…What an odd website… Oh well saved me some money. I’m also the high bidder in the stickers but I doubt that will last. Yeah, the poster’s design is good, but I don’t care for the artist’s style. hey i won the stickers! woot! even if the mother 2 part of mother 1+2 is impossibly hard, might aswell chip away at it, i mean, with no new MOTHERS to wait for, what else is there to do? Plenty of things, they just aren’t mother related….